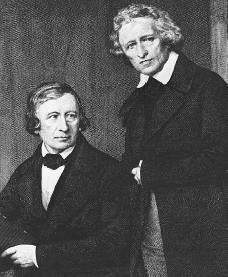 The brothers Jakob and Wilhelm Grimm were German scholars known for their fairy tales and for their work in the study of different languages, which included the creation of "Grimm's law." Jakob Karl Grimm was born on January 4, 1785, in Hanau, Germany. His brother, Wilhelm Karl Grimm, was born on February 24 of the following year. They were the oldest surviving sons of Philipp Grimm, a lawyer who served as Hanau's town clerk. As small children they spent most of their time together; aside from a brief period of living apart, they were to remain together for the rest of their lives. Their even-tempered personalities made it easy for them to work together on projects. The main difference in their personalities seems to have been that Jakob, the healthier of the two, had more taste for research work, and it was he who worked out most of their theories of language and grammar. Wilhelm was physically weaker but was a somewhat warmer person and more interested in music and literature. He was responsible for the pleasant style of their collection of fairy tales. The brothers first attended school in Kassel, Germany, and then they began legal studies at the University of Marburg. While there, however, the inspiration of a professor named Friedrich von Savigny awakened in them an interest in past cultures. In 1808 Jakob was named court librarian to the King of Westphalia in Wilhelmshöhe, Germany. In 1816 he became librarian in Kassel, where Wilhelm had been employed since 1814. They were to remain there until 1830, when they obtained positions at the University of Göttingen. The romantic movement in Germany (a movement in the arts that favored a return to nature and a greater focus on national culture, especially folk tales) awakened the Germans' interest in the past of their own country. Although some work in the rediscovery and editing of medieval (from the Middle Ages, 500–1500) German literature had already been started in the eighteenth century, it was the poets and theorists of the next century who first focused national attention on the origins of German culture and literature. While most of the poets viewed medieval literature mainly as an inspiration for new writing, others turned their attention to the investigation of the past. The Grimm brothers were the most important of these early language and folklore romantic historians. collection of German folk songs. Following their own interests in folklore and legends, the brothers brought out their first collection of tales, Kinder-und Hausmärchen (Tales of Children and the Home), in 1812. These tales were collected by recording stories told by peasants and villagers. Wilhelm put them into written form and gave them a pleasant, childlike style. The brothers added many scholarly footnotes on the tales' sources and different versions. In addition, the Grimms worked on editing existing pieces of other folklore and early literature. Between 1816 and 1818 they published two volumes of Deutsche Sagen (German Legends). At about the same time they published a volume of studies in the history of early literature, Altdeutsche Wälder (Old German Forests). In later years their interest in older literature led the Grimm brothers to a study of older languages and their relationship to modern German. Jakob especially began to specialize in the history and structure of the German language. The first edition of his Deutsche Grammatik (German Grammar) was published in 1819. The brothers, especially Jakob, were also working to document the relationship between similar words of related languages, such as the English apple and the German Apfel. Their creation of the rules for such relationships became known as "Grimm's law." It was later expanded to account for all word relationships in the Indo-European group of languages. The Grimm brothers were not the first to take note of such similarities, but they can be credited with gathering the bulk of linguistic (related to language) data and working out the details of the rules. In 1830 the brothers moved to the University of Göttingen, where Jakob was named professor and head librarian and Wilhelm was appointed assistant librarian. As professor, Jakob held lectures on linguistics and cultural history. Wilhelm also attained the rank of professor in 1835. Both were dismissed in 1835 for political reasons. (They had joined in signing a protest against the King's decision to abolish the Hanover constitution.) They first moved back to Kassel but later obtained professorships at Berlin, Germany, where they were to remain until their deaths. The Grimm brothers' last years were spent in preparing a complete dictionary of the German language, tracing the origin of every word. The first volume, published in 1854, has 1,824 pages but gets only as far as the word Biermolke. Four pages are devoted to the letter A alone, which is termed "the most noble and primeval [ancient] of all sounds." The Grimms' dictionary was carried on by generations of scholars after the brothers' deaths, and it was finally finished in 1960. Its completed form consists of sixteen large volumes. Wilhelm died in Berlin on December 16, 1859. Jakob continued to work on the dictionary and related projects until his death in Berlin on September 20, 1863. Peppard, Murray B. Paths through the Forest: A Biography of the Brothers Grimm. New York: Holt, Rinehart, and Winston, 1971. Zipes, Jack David. The Brothers Grimm: From Enchanted Forests to the Modern World. New York: Routledge, 1988. Zipes, Jack. The Great Fairy Tale Tradition. New York: W. W. Norton, 2001. Wow. Any writer can basically be called a poet. Being a poet doesn't mean you write a few sentences that rhyme. It is a style of writing, and every writer has their own style. They don't mean the Brothers Grimm were like Dr. Seuss or something like that. "The scientist is not a person who gives the right answers, he is one who asks the right questions." I think the article was very insprirational to all ages. The Grimm brothers were very talented with was clearly shown through their short stories. The brothers grimm were so not poets!! We are doing plays on them at school and they wrote different versions of tales like Cinderella where the sisters cut off each others feet!!! How lovely is that all of you POETS! The Grimm Brothers were poets. The connotation of "poet" has changed in the twenty first century. When the Grimm Brothers first began their collection process, their major intent was to create a source to which students of folklore--specifically German folklore--could refer. However, as the general public didn't like their first publication (1812) the Brothers re-edited the collection. This was when they, particularly Wilhelm, began adding more literary elements to the tales. By their third publicatoin, their tales potentially seemed more "kid friendly," as they were fitting the fairy tale trend of the time.